The VIIRS instrument aboard the new Suomi National Polar-orbiting Partnership (NPP) satellite has a lot of jobs: among them, to measure cloud and aerosol properties, ocean color, sea and land surface temperature, ice motion and temperature, fires, and Earth’s albedo. Now, with the experience of Superstorm Sandy behind it, add tracking power blackouts to the list of tasks for this multifaceted instrument. VIIRS–or more formally, Visible Infrared Imager Radiometer Suite, is a scanning radiometer that collects visible and infrared imagery and radiometric measurements of the land, atmosphere, cryosphere, and oceans. Its low-light sensor–known as the day-night band–can detect light from cities and towns in the absence of clouds. 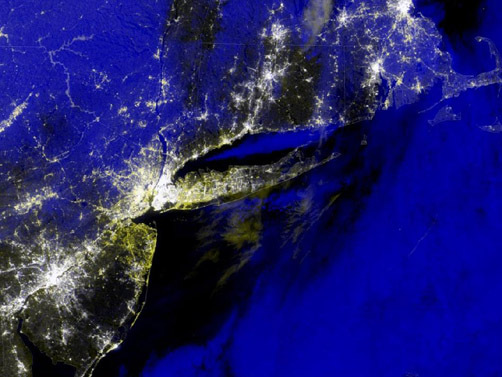 This function recently proved to be highly valuable when NASA’s Short-term Prediction Research and Transition Center used data from VIIRS to assist disaster responses agencies (including FEMA and the U.S. Army Corps of Engineers) in identifying areas that lost power during Superstorm Sandy. Composites of VIIRS images taken before and after Sandy (see below for an example) pinpointed the blackouts. This is just one example of the promising capabilities of VIIRS; and the growing awareness of these capabilities is why VIIRS is the subject of a town hall meeting on Monday, January 7 (12:15-1:15 p.m., Room 18B) at the AMS Annual Meeting in Austin. Forecasters, meteorologists, and other end users will discuss how they are utilizing the new VIIRS datastream and the critical role it can play in weather forecasting and in improving emergency preparedness and disaster response efforts. A number of other presentations in Austin will highlight the versatility VIIRS. Jeffrey Hawkins of the Naval Research Laboratory will take an in-depth look at VIIRS’s day-night band and efforts to create enhanced products geared toward various nowcasting applications (e.g., dust enhancement observations, smoke and volcanic ash plumes, cloud properties, tropical cyclone structure, etc.) (Wednesday, 1:30 p.m., Ballroom G). Donald Hillger of NOAA/NESDIS will compare and contrast imagery produced by VIIRS with that from other satellites (Tuesday, 11:45 a.m., Ballroom G). And Jim Biard of the Cooperative Institute for Climate and Satellites will provide details on the VIIRS Climate Raw Data Record (C-RDR), including its contents and structure, its production methods and process, and file access (Wednesday, 11:30 a.m., Ballroom G). VIIRS is one of five instrument/sensor payloads aboard Suomi-NPP, which is the first of a new breed of satellites that will replace NASA’s Earth Observing System satellites. Launched in October of 2011, the progress and promise of Suomi-NPP and its new data applications will be explored at a town hall meeting on Tuesday (12:15-1:15 p.m.; Ballroom G). Speaking of Superstorm Sandy, electricity outages, and town hall meetings, there are two related Town Halls of special importance Monday night at the AMS meeting: a wide-ranging meeting on the storm itself (7:30-9:30 p.m.; Ballroom E) and an exploration of the impacts of weather on the electrical grid (Monday, 6:30-8:00 p.m.; Room 14). More on this in future posts on The Front Page. A composite image created from the VIIRS day-night band shows a portion of the Atlantic seaboard on November 1, 2012, just after Superstorm Sandy dissipated. The yellow regions indicate urban areas that had power before Sandy, but not after. From NASA SPoRT.